How to use audit logs to monitor and audit user activities within your organization. Audit Logs provide a single source of all user activity within a Fulcrum plan. These logs can be monitored, reviewed, or exported by users with the owner system role to perform your own analysis. An audit trail can be used to prevent suspicious activity if actively monitored, or to playback account activity during an incident review. To access the audit logs, start on the Fulcrum homepage. 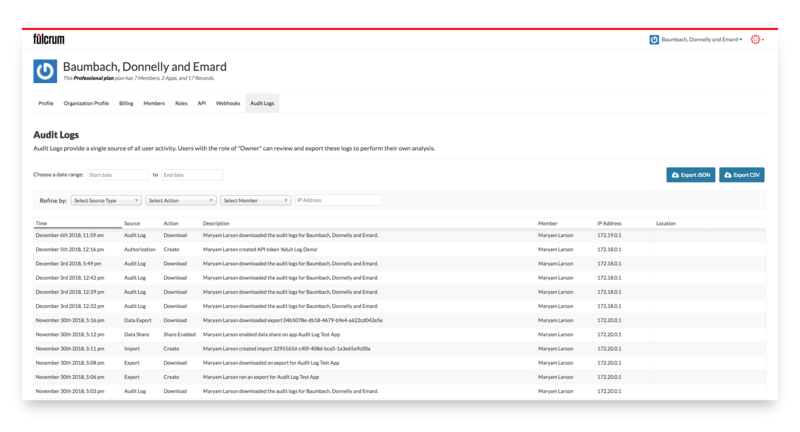 Click the red gear icon in the upper-right and select "settings"
You can filter the audit log table to limit the results for specific sources, actions, members, or IP addresses. You can also provide a date range, which can be used in conjunction with the other filters. To sort the audit log table, click on the header of the column that you wish to sort by. Source: The type of log entry (export, data_export, membership, layer, project, audit_log, role, form, data_share, classification_set, authorization, choice_list, import, organization, webhook). Action: The action that was logged (update, create, permission_update, download, delete, reset, share_enabled, share_disabled, update_credit_card, plan_change, billing_emails_change, update_storage, add_credit, change_default). Description: A brief description of the logged activity. Member: The name associated with the user account that performed the action. IP Address: The Internet Protocol address of the device that triggered the action. Location: The approximate IP location from the device which triggered the action. You can export the filtered results in the audit table by using the export button that is located in the upper right corner of the page just, above the table and filter options. Below is a list of the sources and corresponding actions that are logged. Audit logs are available on Enterprise plans.